Every single second of every single day is filled with choices, millions of choices perhaps. So why does it sometimes feel we have no choice? We’ve all felt stuck in the midst of a tricky relationship moment where there just seems to be no other way than… (fill in the blank). Even if it’s an action we’d rather not take because we’re sure it will cause pain and will damage the connection we share with a loved one, it seems like the only thing to do. Sometimes, in fact, there is no notion of choice—it’s just how things have always been and so that’s what we do. Believe it or not, it doesn’t have to be this way. The habitual ways you live your life and move along in your love relationship are all tied in with choices. Daily, you choose to stay with this person whom you love and, at times probably, struggle with. You choose to avoid certain topics when around your partner and to confront him or her about other issues. When we forget we have the power of choice, relationships tend to get stuck in habitual ways of living. 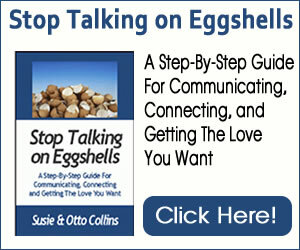 It might even seem like your relationship is on auto-pilot and you and your mate are virtually powerless. A friend of ours orders spaghetti with meat sauce just about 99% of the time he visits an Italian restaurant. We wonder with amusement why he even looks at the menu because, undoubtedly, he orders spaghetti with meat sauce. Of course there’s nothing wrong with his food choice. It is something he loves to eat, so why not?! However, if our friend developed an aversion to spaghetti with meat sauce and continued to always order it, this would make no sense. As silly as our example may seem, you probably do the same thing in your relationships—and we’re not talking spaghetti here! Perhaps you and your partner have a misunderstanding about money. This is the hot topic for you two and so you both avoid it whenever possible. A situation arises where a bill inadvertently doesn’t get paid and you avoid bringing it up because you know it will lead to a fight. At the same time, the late fees continue to accrue. You feel caught between the desire to avoid an argument with your mate over a touchy topic and the desire to just get the bill paid and stop racking up fees. The solution to anyone looking in on such a scenario may seem simple—pay the bill and move on—but when it’s your relationship habit, it’s usually not so simple. Acknowledge that you have choices. A first step that can be quite empowering is to remind yourself that you do have choices. Again, this is simple and obvious to anyone else not in the midst of a particular issue or situation that triggers intense feelings. Paying an overdue bill can be as mundane or heated as the people involved make it. No matter how trapped you feel in the way you think you “have” to go, remind yourself that you do have choices in this moment. You may not be able to see any other options than what you’ve always done. Despite this perception, tell yourself that choices are there. Know that this affirmation can mean opening the door—even just a crack—to let in awareness of more possibilities than the one staring you in the face. Open up to all choices. In a situation that consistently gives you and your partner trouble, you might want to try this exercise. Take out a piece of paper. You can do this by yourself or with your mate. Write down the situation at the top of the paper. Choose words that leave out blame and as much as possible just state what you are observing. In the scenario above, the couple may write down: “The gas bill is overdue.” Underneath the statement of what you observe, write down as many potential options as you can think of. Don’t leave anything out—even if you think it is silly or something you would never do. Simply not paying the gas bill is something the couple would never consider, but they write it down anyway. Once you have your list, notice that there really are choices in any situation. Pay attention to how you feel affirming to yourself that you do indeed have the power of choice. Making this list will probably not magic away the couple’s tensions around money. This is a topic for them to explore within themselves and together. What it does do, is separate the emotional baggage the couple has about money from the gas bill that does indeed need to be paid. At this point, they can pay the bill more easily and move on to their feelings behind the situation and the possibilities for connecting ahead. The more choices you realize you have, the more empowered you can feel. As you realize this and act accordingly, you have the potential to open up to closer connection more of the time with the one you love.